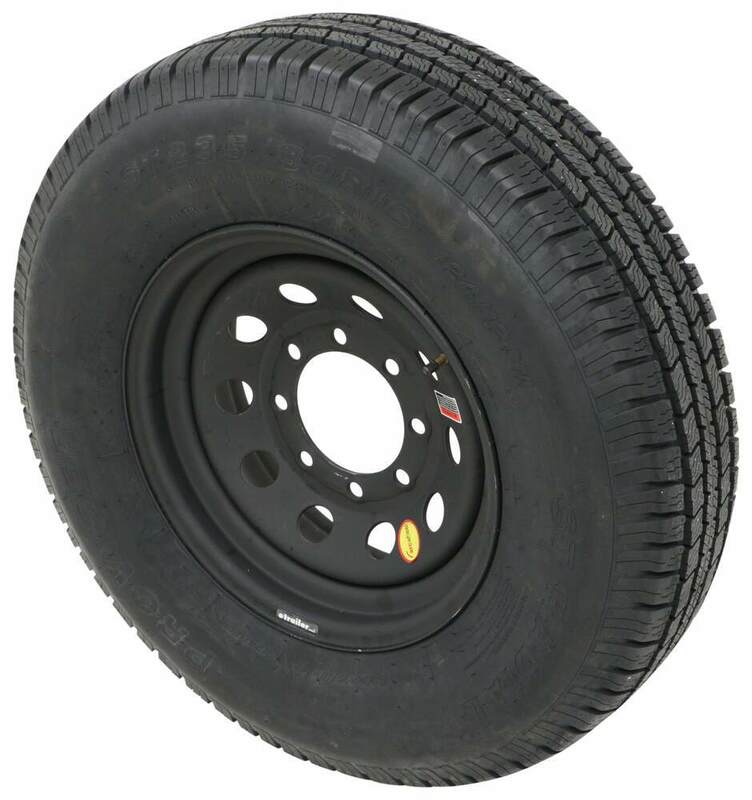 Radial tire with automotive-grade tread has 10-ply rating and 3,520-lb max load at 80 psi. 16" x 6" Steel wheel has eco-friendly ESR finish for better saltwater protection than galvanized wheels. Complimentary roadside assistance included. Lowest Prices for the best tires and wheels from Taskmaster. 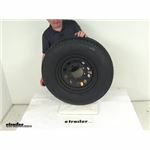 Provider ST235/80R16 Radial Tire w 16" Steel Mod Wheel - 8 on 6-1/2 - LR E - Black ESR Finish part number A16RTK8DMM can be ordered online at etrailer.com or call 800-298-8924 for expert service. 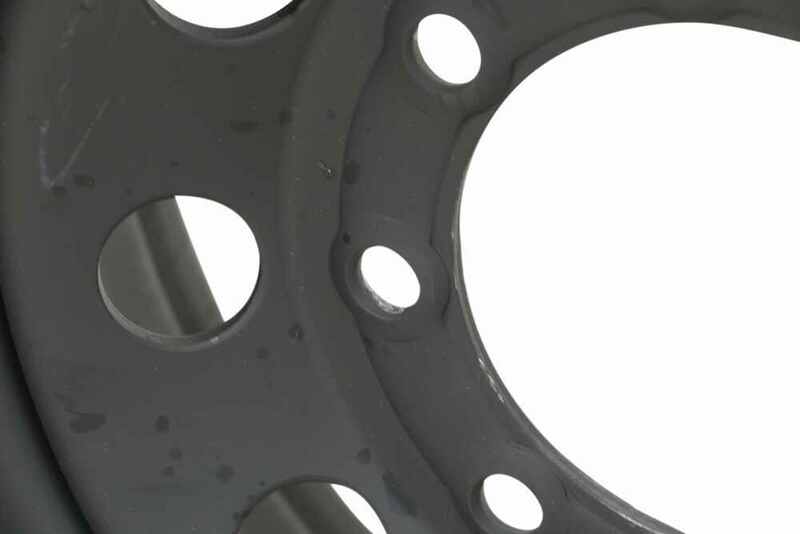 Heavy-duty 16" x 6" steel trailer wheel has 8 on 6-1/2 bolt pattern and 4.88" pilot diameter. Environmentally friendly PVD coating process creates a sleek, durable, and corrosion-resistant finish that won't pit or peel like chrome. 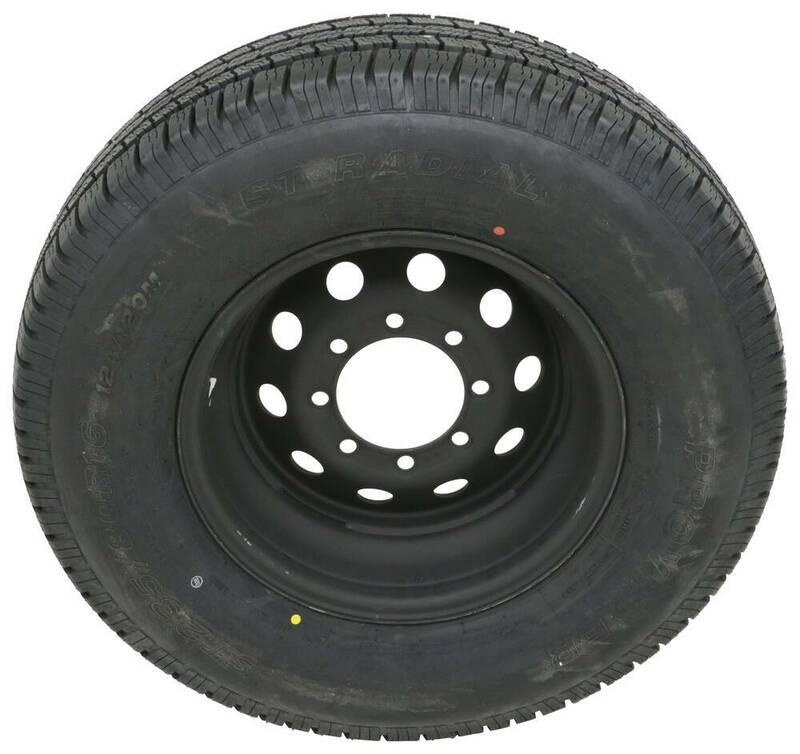 Speaker 1: Today we're gonna take a look at the Provider ST 235 80R 16 radial trailer tire in a load range E, on this 16 inch black steel modular wheel with the 8 on 6 1/2 inch bolt pattern and the ESR finish. 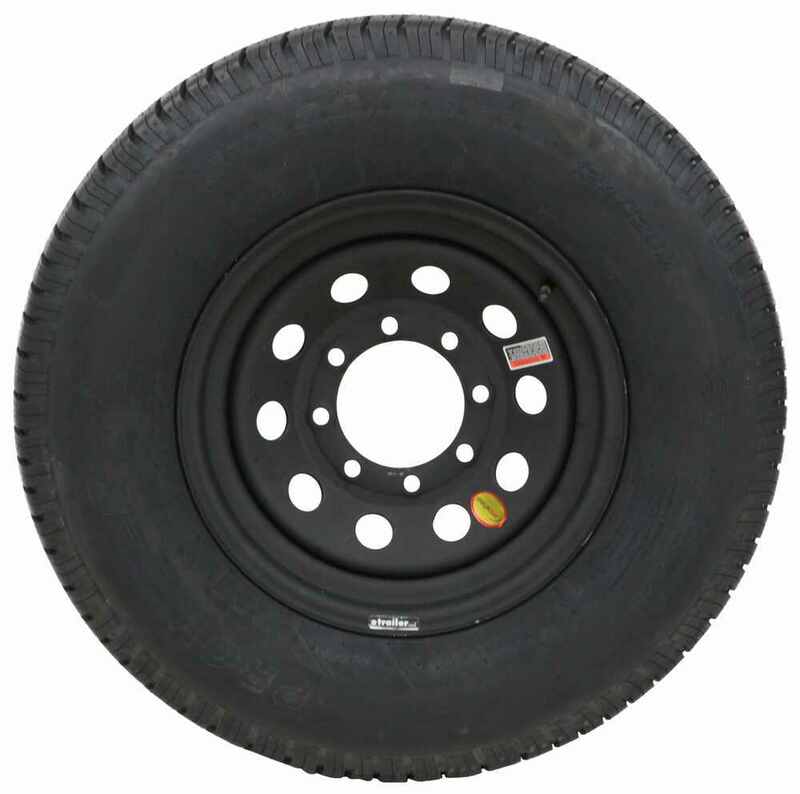 Now this tire and wheel assembly is ideal for boat trailers, stock trailers, utility trailers, and even campers. The wheel is a sturdy steel wheel. It is a modular design, and when we say modular design, that's the one that has the round holes all the way around the wheel. This wheel does use the ESR finish on it, which is extreme salt resistance finish. It helps weather the elements better than galvanized finishes. It uses a matte black finish that's sprayed over an eco primer. It gives you excellent corrosion resistance with a salt spray rating of more than 700 hours, and the finish is applied through an environmentally friendly technique. It also has the ITR technology, which is improved torque retention. 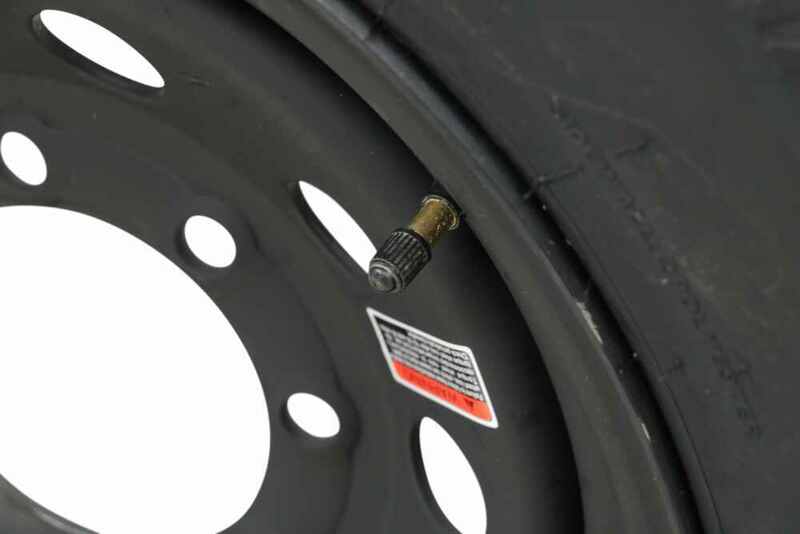 It's designed to help keep your wheel securely in place on your trailer. 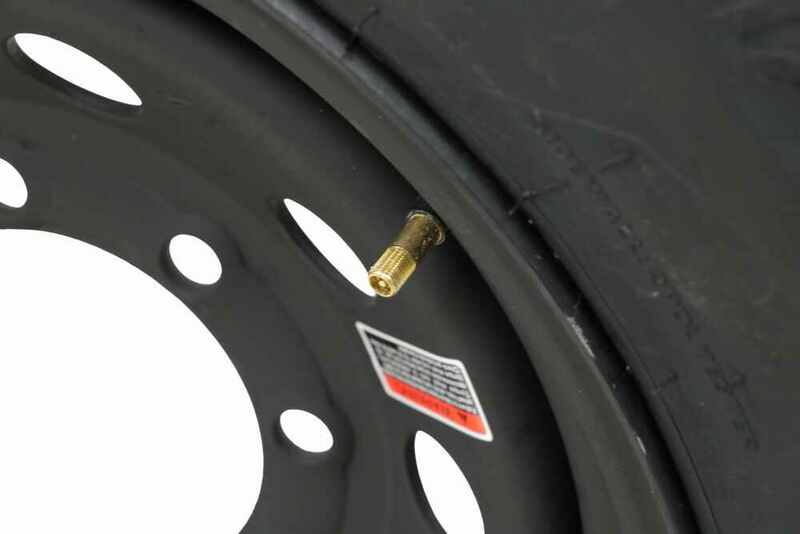 They use the uncoated stud holes, which are beveled, to give you better clamp force or tension.Now the tire that's on this wheel is a radial tire. It is constructed with double steel belts, double polyester cords for a nice long life. It's great for highway use. 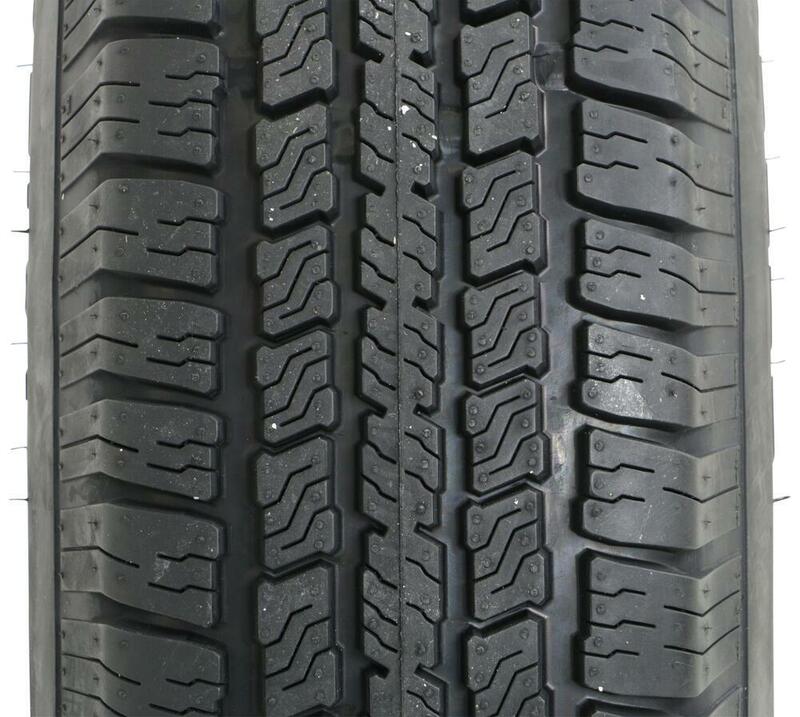 They also use a nylon tread firming belt overlay around the tire, which helps prevent tread separation, and they also use the tread depth bars like you'll see in passenger car tires, that'll give you a quick visual indication of the tread wear.This tire is bake-tested to ensure that the rubber will hold up over time. And the tread on this tire is an automotive grade tread. When we say that, if you look at the tread blocks, you'll see the cuts in it are sipes 00:01:29, they're called. These sipes will break up the water underneath the tire, help channel it away from underneath. It improves your traction during wet, snowy, or icy conditions. This tire is a special trailer tire design. It couples the strength of a bias tire with the durability and stability of a radial tire. 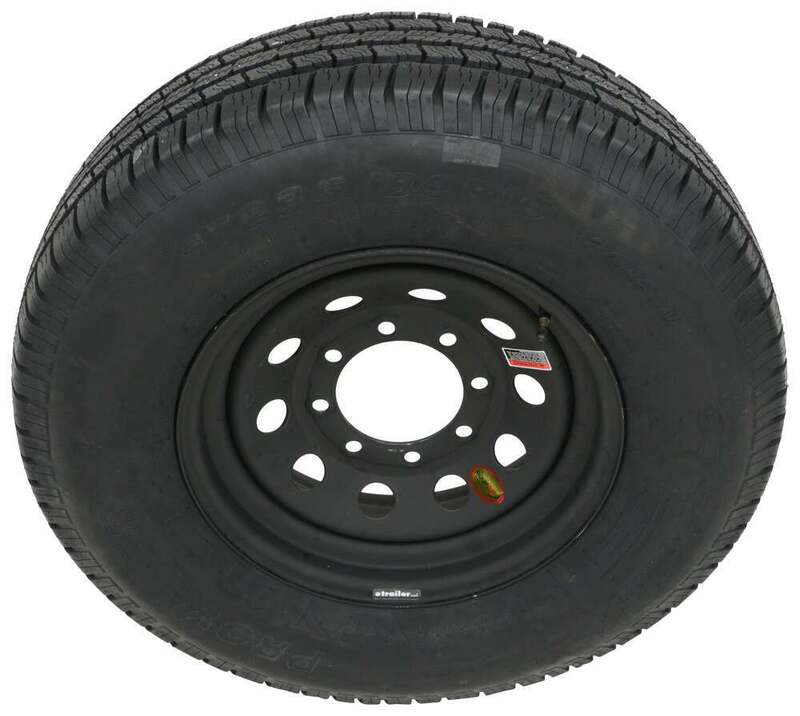 It is created specifically for trailers, it's not intended for use on any other vehicles.This whole assembly does come with a two year platinum plus warranty, which includes emergency tire change service and other benefits. This assembly does meet the DOT, Department of Transportation, specifications, and it does exceed your federal motor vehicle safety standards.A few specs on this, we'll start with the wheel. The dimensions on the wheel, the diameter of the wheel, when you measure a diameter it's always measured bead seed to bead seed, or inside to inside. So it's 16 inches. The width on just the wheel is 6 inches wide. This wheel does have a bolt pattern of 8 on 6 1/2 inches, and if you want to measure that on a wheel that's an even number of lugs, in this case, 8. It's pretty easy because the hole is right across from every hole. So you just pick one, any hole, let's say this one. And you'll measure directly across to the center of this hole right across from it. So that'll measure 6 1/2 inches. So that'll give you a bolt pattern of 8 on 6 1/2 inches.This does use a wheel lug size of 1/2 inch by 20, or 9/16 by 18 pilot hole diameter, which is the large hole here in the center of the wheel. It goes over the hub on your trailer. It's 5.12 inches. Now, the weight capacity on just the wheel is 3,750 pounds. 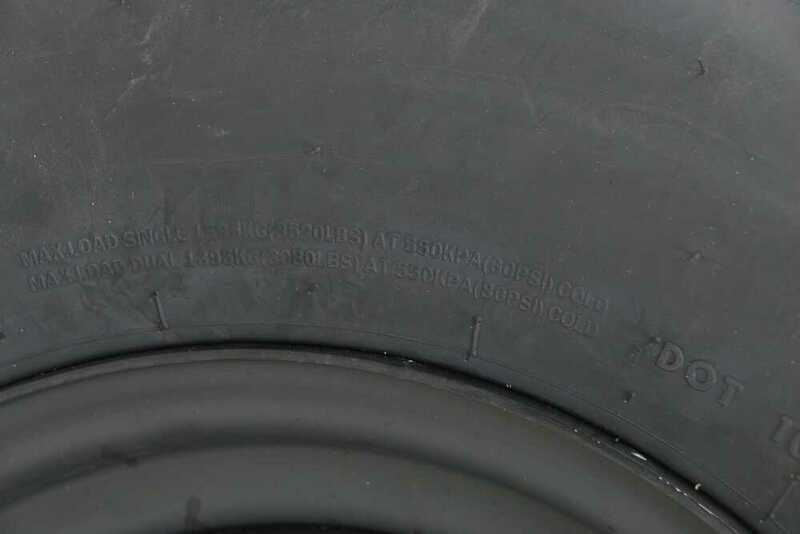 The tire size, which will be stamped on here, ST for special trailer, 235 80R 16, the R means it's a radial tire. Section width on it is going to be 9.3 inches. Overall diameter from the bottom to the top when it's inflated is 30.8. this tire is a load range E, which means it's a 10-ply rated tire. 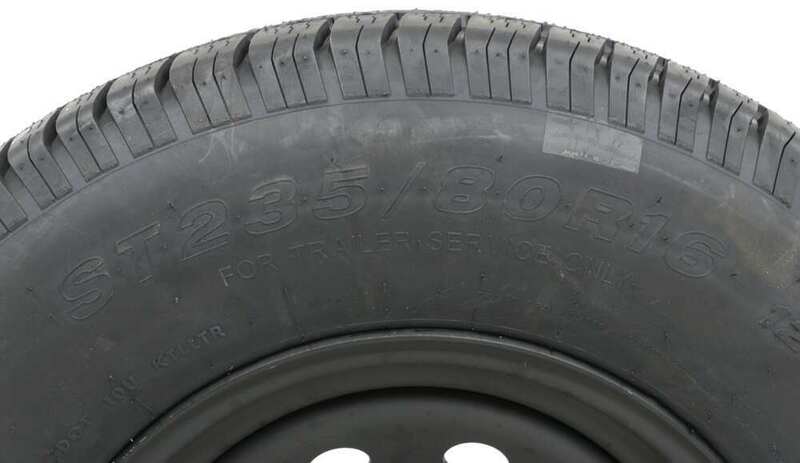 It has a maximum load capacity of 3,520 pounds at 80 PSI.The last thing I do want to mention is, most all the new trailer tires are coming through with a speed rating now, and they do stamp that on the tire. It's usually designated by a letter designation. So if you look right after the size we just went over, those two numbers for the load index, and then the letter M. Speed rating M will mean 81 miles per hour. 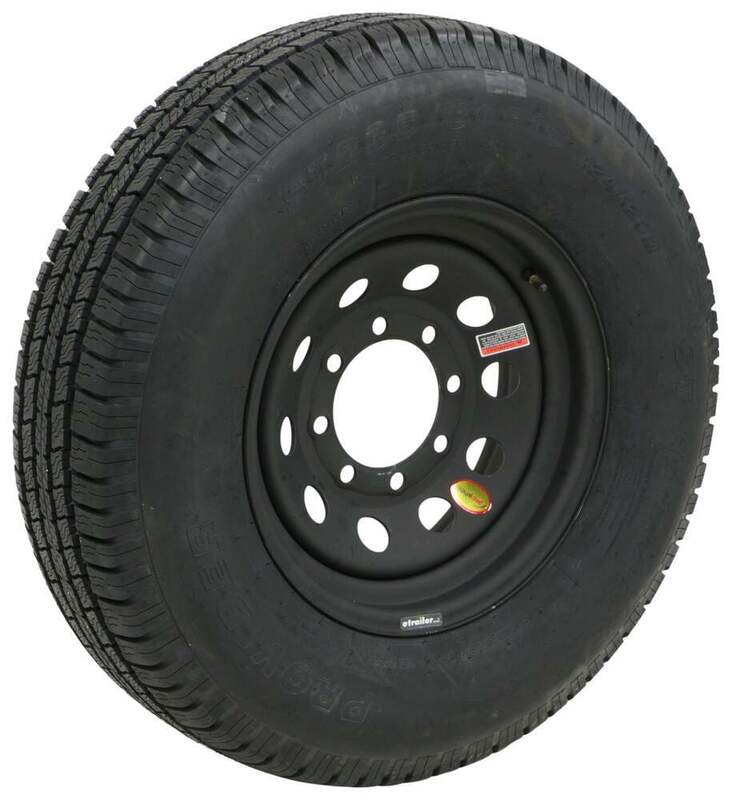 But that should do it for the review on the Provider ST 235 80R 16 radial trailer tire in a load range E on this 16 inch black steel modular wheel with the 8 on 6 1/2 inch bolt pattern and the ESR finish. 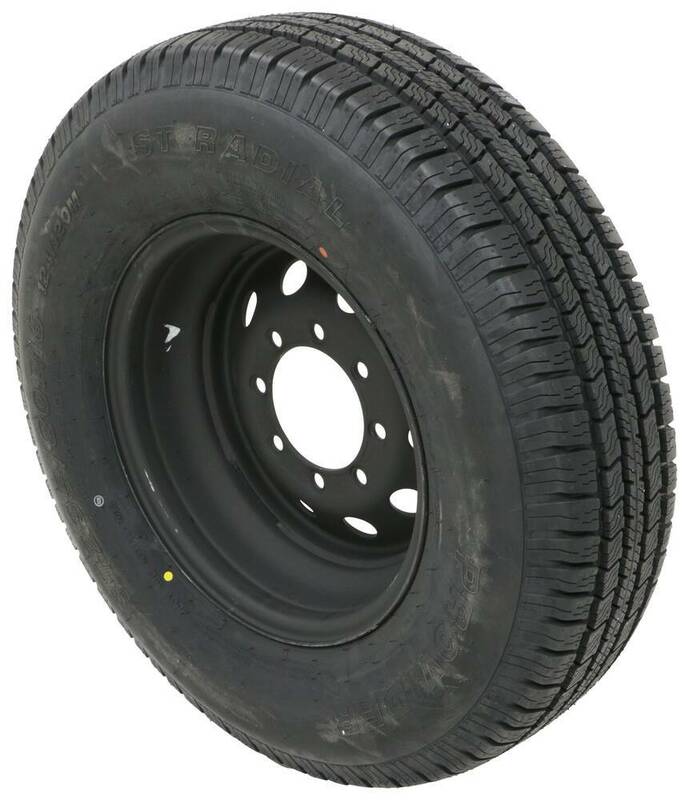 Order: RelevanceNewestRating - High to LowRating - Low to High Radial tire with automotive-grade tread has 10-ply rating and 3,520-lb max load at 80 psi. 16" x 6" Steel wheel has eco-friendly ESR finish for better saltwater protection than galvanized wheels. Complimentary roadside assistance included.